January is almost over, one day left to be exact, but I did manage to complete the January tag in the 12 Tags of 2013 on Tim Holtz’s blog. I really missed not doing the 12 Tags of Christmas in December so I made a promise to myself that I would try to get all of Tim’s monthly tags done this year. One a month is not that much to commit to, so I thought! As always I enjoyed the process of following along and putting my own little spin on things. 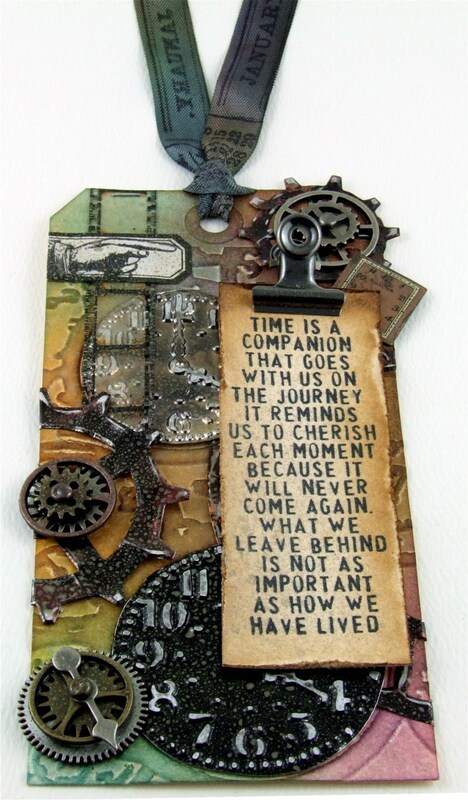 I did not venture too far from Tim’s tag but I did add a little embossed metal and some clock parts. Just had to do it! !